Little A just turned three. We had a party. Little A and Big A had a lot of fun. And I stressed about what to cook. At least I had my signature sausage rolls to fall back on. Birthday parties are a big thing in Australia. When I was in Taiwan, I think we went to maybe two or three birthday parties. I don’t remember Big A ever being invited to parties with his best friends at childcare. The teachers did a bit of a ceremony with cake at the childcare centre, and that was pretty much about it. But since we returned last February, we seem to have birthday parties nearly every second or third week. They are fun, but also a lot of pressure. As a single parent, I know I don’t have the energy for the big backyard jumping castle she-bang. So I opted for a party at the Kippax Uniting Church, which has a fantastic creche. And I made sausage rolls. To reduce the cost I made my own flaky pastry, based on Delia Smith’s recipe. It is very easy, her technique is flawless (love the tip about freezing the butter and then grating it) and my only suggestion is to reduce the butter slightly (you can use as little as 65g rather than the 75g she recommends). OMG, the pastry is so buttery and sooooo good. Eating it felt indulgent in a weird wholesome way that manufactured puff pastry can’t replicate. But substitute puff pastry if you would prefer as it is certainly easier. To be honest, you can pick up plain label sausage rolls cheaply at the supermarket. There is nothing really wrong with them, but homemade ones have the ‘wow’ factor that store bought just can’t beat. 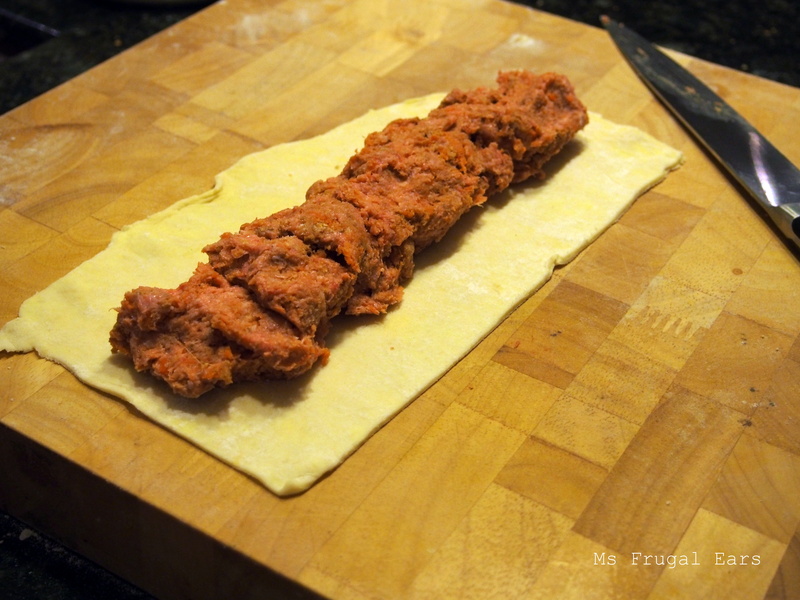 Once you have rolled them in pastry and cut into pieces, you can freeze for future use. If you are entertaining at home they are then easy to pop out and cook in the oven to be ready just in time for your friends’ arrival. I bet they will be impressed. 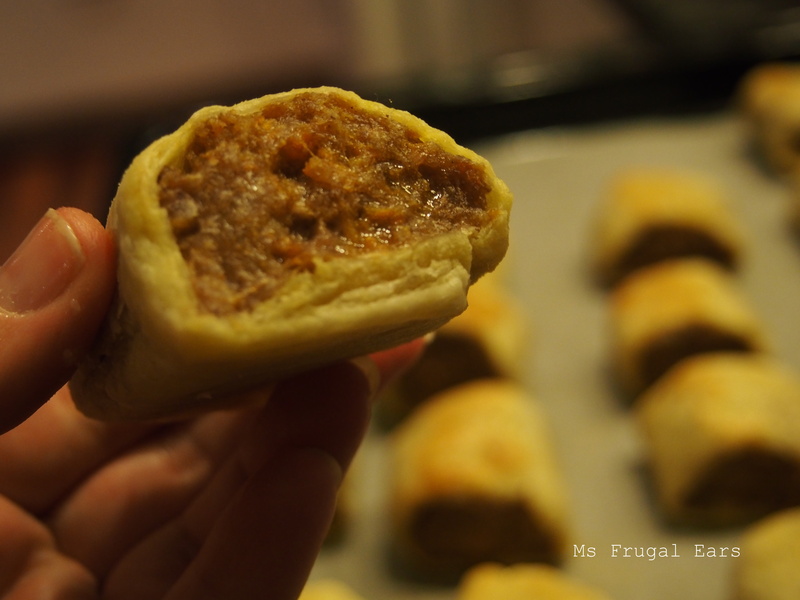 My recipe makes between 22 and 24 party sized sausage rolls, and costs $2.65 to make (11c to 12c each). Tomato sauce extra. 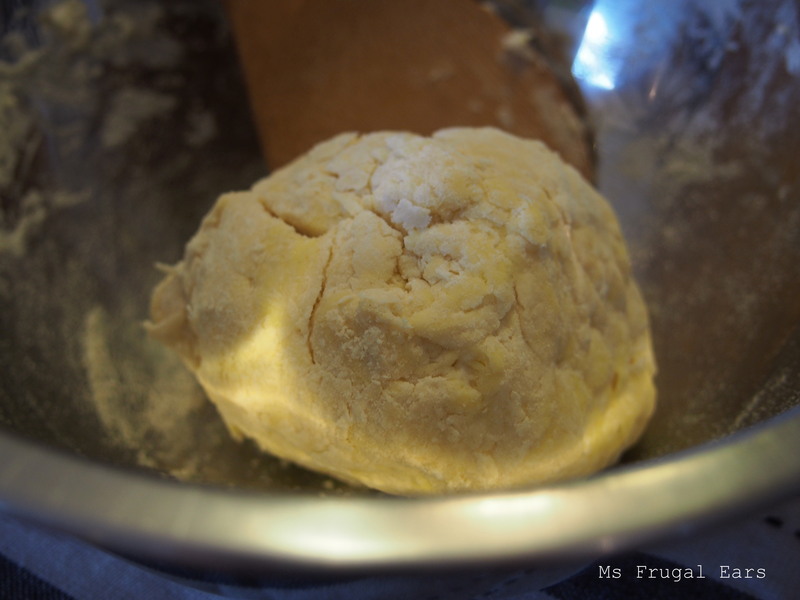 Make the pastry following Delia Smith’s method (grate the butter into the flour, add some salt, using a rice paddle coat the butter with the flour, gradually sprinkle with water, combine into a ball, leave to sit in the fridge for 30 minutes, roll out into a square and then cut into two pieces). Take 4 to 5 pieces of leftover/day old bread and bake in the oven until dry. Whizz in a food processor until they resemble fine grains of sand. Store in a dry container until ready to use. To make the sausage mix, squeeze the sausages out of their casings. (Note: you can buy ready-made sausage mix but I prefer ALDI sausages.) 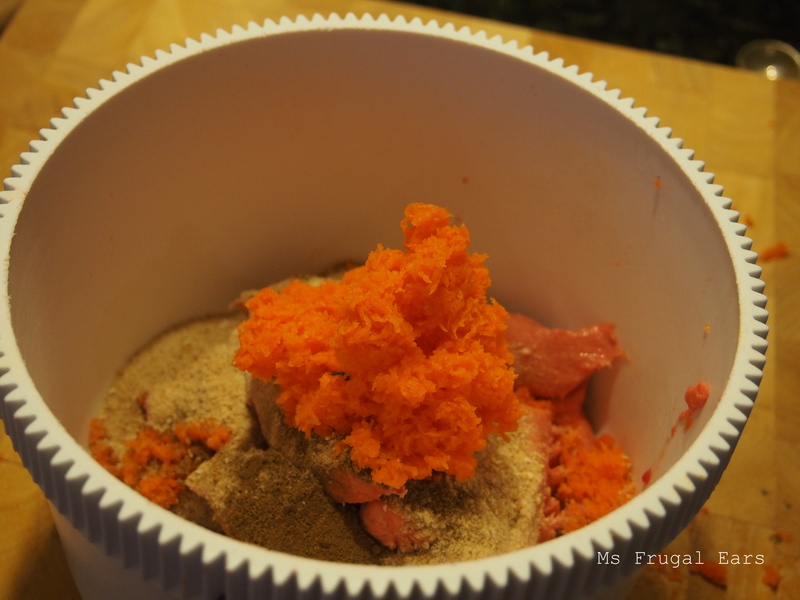 In a bowl combine the sausage mince with the onion, carrot, breadcrumbs and five spice powder. Mix thorough to combine. 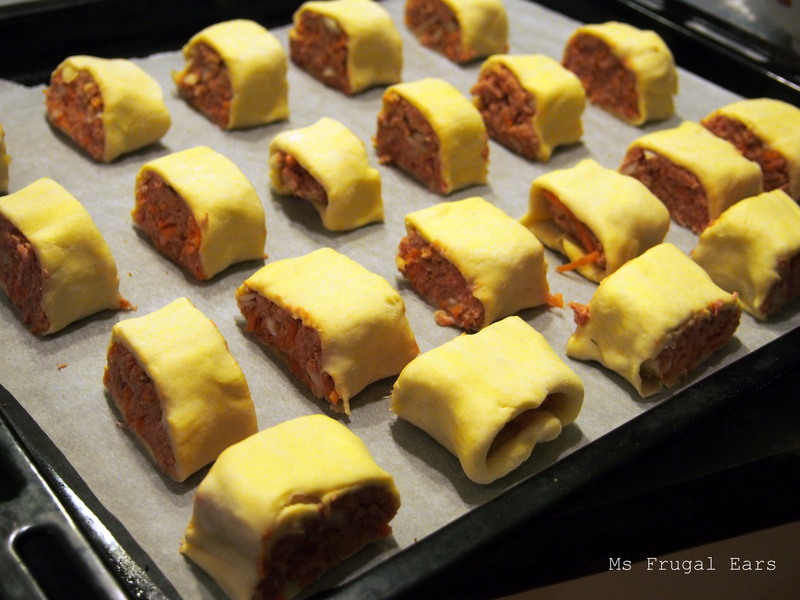 Place the sausage mixture down the centre of a piece of pastry, roll the pastry over, and cut into pieces. Place the sausage rolls on a greased or lined tray, prick with a fork and brush with beaten egg. Bake in a very hot oven for around 10 to 15 minutes or until well done. Thank you. 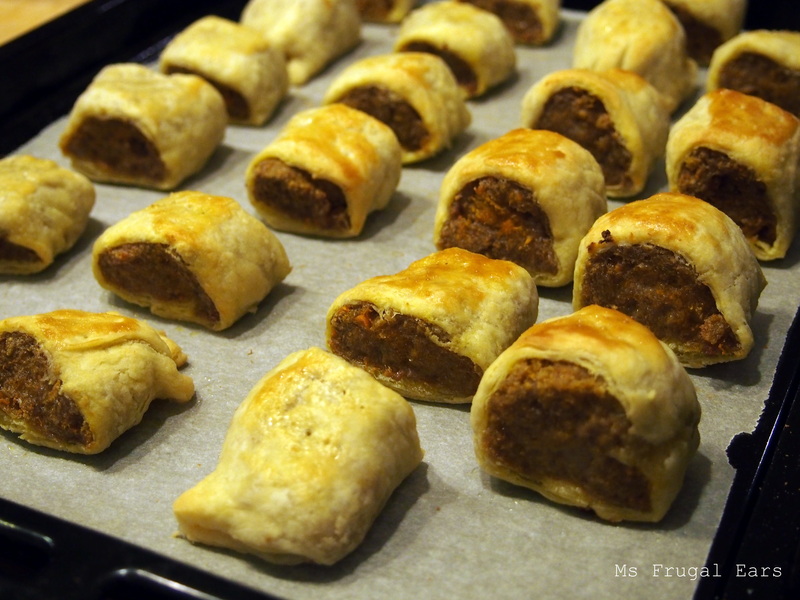 Sausage rolls always go over well, as my Nana would say.